Has the quantity and type of food we eat in America changed? Consider this; the average women in America in 1970 consumed just less than 1500 Calories per day to maintain a healthy weight, and this was not considered a weight reducing diet at that time. Research also shows that men in the same year ate on average just under 2500 Calories daily. Over 40 years later, it is really too easy to eat more than you need, and a fast food meal can contain 1500 Cal in a single sitting. For example a Big Mac, large fries and large soda will pack a whopping 1340 Cal into one meal, before you even think about eating or drinking anything else in the day. People can also fall into the trap of overeating even on “healthy food”. For example a supper salad (chicken, cashew nuts, avocado, peanut oil dressing and tortilla strips) at the Cheesecake Factory can set you back a staggering 1900 Cal before you even reach for the bread on the table. Astounding but absolutely true! Do Calories really count? 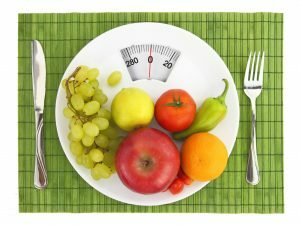 Calorie restriction has been used for decades to promote weight loss. But the truth is that restricting Calorie intake is only part of the solution, when you want to lose weight and be healthy. Calories are like “packaging”, what is in the package is more important than the package itself. The Calorie content of the food, does not tell you anything about the nutritional quality or the metabolic impact of the food you are about to eat. The best foods to eat will have positive effects on your nutrient intake and your metabolism. When you get this right, appetite control and weight loss is a whole lot easier. The metabolic responses to food vary, but in general it is important to know that controlling blood sugar and insulin levels make it easier for your body to access your fat stores and for you to lose weight. Tip 1: Be intentional. We all face multiple opportunities to eat every day; friends, family, work colleagues and even a trip to the grocery store can make food choices available to you that you had no intention of eating earlier in the day. Be intentional, plan what you intend to eat and follow the plan. Limiting how often you eat in the day can help you stick to your Calorie and food goals more easily. Tip 2: Bulk up on Fresh Produce. Increase the volume of meals with nutrient rich lower Calorie fruit and vegetable options. Great appetite control comes from feeling full after you have eaten. The volume and weight that fruit and vegetables provide at a meal will make you feel more satisfied after eating. This is because something heavy in your stomach triggers a special nerve called the vagus nerve, to send a signal to your brain that you are full and should stop eating. The fiber content of fruit and vegetables will also help to slow down the rate of digestion and the absorption of glucose, resulting in you feeling fuller for longer. It is a lot easier to eat less and follow your healthy meal plan when you feel full and satisfied. Tip 3: Rethink your drink. Beverages can really add to your daily Calorie and sugar intake and can affect appetite negatively, making you feel hungry. For example, a Venti Starbucks Caramel Frappuccino blended coffee can set you back 510 Calories and 84 grams (21 teaspoons) of sugar. Beverages high in Calories and sugar can blow your Calorie budget for the day before you even take a bite of real food. Nonetheless, don’t fall into the trap of consuming excessive amounts of “Calorie Free – Diet Drinks” either. Beverages sweetened with artificially sweeteners can also play havoc with your appetite, blood sugar and food cravings. Choose water, herbal tea, sparkling water, unsweetened seltzer waters, or infused water to quench your thirst. Tip 4 Check your cooking methods. We all know by now that olive oil, avocado, nuts and seeds are healthy. This is true! These foods, which form part of the Mediterranean diet, have been associated with a lower risk for chronic disease conditions such as cardiovascular disease and diabetes. Nonetheless, quantities still matter. Because a food is healthy, does not mean we don’t need to check the quantities of the food we consume. Many short cooking videos on social media today, show the “chef” using copious amounts of olive oil or other healthy fats in recipes. But fat is Calorie dense, and all fat types no matter where they come from will provide 9 Calories per gram. This means that a ¼ of a cup of olive oil (4 measured tablespoons) will provide 480 Calories, almost as many Calories as a MacDonald’s Quarter pounder with cheese. The answer is not to avoid “healthy fats” but use them sparingly and be conscious of how much you are adding to your foods. Fat is certainly valuable to your health and can help you to feel full and more satisfied after a meal, but fat is not helpful to your weight goals when used excessively. Try to use lean cooking methods, such as broiling, steaming, oven baking, dry frying, poaching, and cooking in an instant pot or crock-pot. Use delicious healthy fats as tasty additions to meals, such as chopped avocado on a salad or a small serving of chopped nuts added to a breakfast parfait of fruit and yogurt. Tip 5 Move More. Ok, so you are probably thinking: ”Yes I know”, I need to exercise more to burn up some of the Calories I am eating. Well this is only part of the reason and a small part at that. The importance of exercise needs to be emphasized, as it is a key component for health and essential to helping you to keep weight off that you have lost and maintain a healthy weight. Unfortunately, physical activity has just about vanished from the American lifestyle. You can shop on line for just about everything and it will arrive at your front door in anything from a couple of hours to a couple of days. Hours of walking around stores or shopping malls are a thing of the past. You can use the drive through to: pick up your groceries, do banking, get meals or coffee, drop off dry cleaning, or collect medication from the pharmacy. You never need to get out of your car. Sit, Sit, and Sit. We sit at work, sit for entertainment, sit in restaurants and have to have electronic deices to remind us to stand and move. The problem is that this sedentary way of life is destroying our metabolisms. As we sit around and move very little we slowly loose “mitochondria”, which are the little organelles that act like small machinery in the cells of your body that create energy. When you don’t use them you will lose them. This means that you lose some of your ability to burn up the Calories you are consuming. So moving more often and on a regular basis will help to boost your mitochondrial numbers (energy producing machinery) and your metabolism, and in the long term will help you to maintain a healthy weight. Exercise also helps to lower the body’s insulin levels. High insulin levels stop the break down of fat in the body, so lowering insulin levels helps with weight loss. Last but not least food cravings are less when you exercise. This means that complying with your overall Calorie goal is a whole lot easier when you exercise. The modern world we live in makes it too easy to be inactive and to eat more Calories than you need and fewer nutrients than you require. These tips when applied will help you to be more successful. Note: Having a personal plan of action can help you to reach your goals. For more information on the individualized meal plans we make for our clients, please call our office and find out more about how we can help you. Or click here to send us a message.